For the Chee siblings, magic is spelt MRGJC. 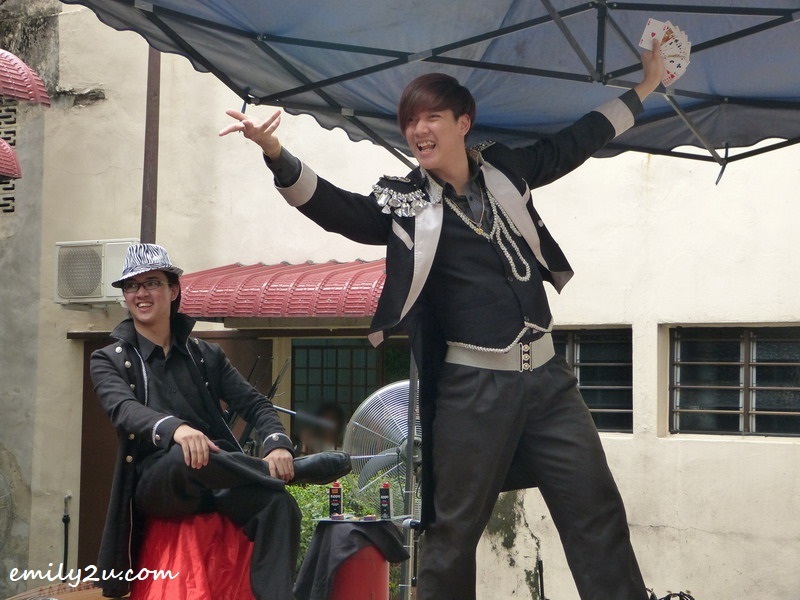 The three brothers who go by the stage names of Melkinn, Raykinn and Gelvinn, and led by big sister Jorinn, are known as the only sibling illusionists in the world recognised by the International Magicians Society (IMS) from the United States of America, and awarded the “Most Multi-Talented Magician Siblings”. This is quite a feat for the Chees, collectively known as MRGJC Quest, from Kajang, who in October 2014 made themselves into the Malaysian Book of Records as the “First magical siblings to have performed internationally in more than ten countries”. 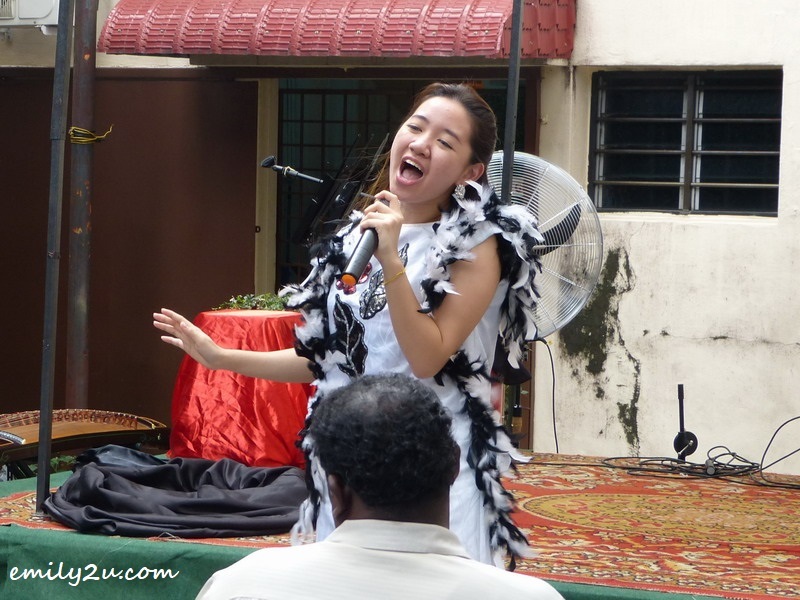 Jorinn, who just turned 21 in October is Malaysia’s first and only female magician to receive the prestigious MERLIN Award from IMS in her own name at the age of 16, back in 2010. She also received the Young Achiever Award from the Malaysia Book of Records under the Icon of Malaysia category. Meanwhile, Gelvinn, 18, is a 3-time consecutive champion at the International Magic Competition and is the first international magician to win Thailand’s KING CUP Award. He also recently gained recognition and bestowed the MERLIN Award by IMS in his own name. Melkinn, 20, and Raykinn, 16, are not far behind. They too won international awards such as the International Open Category – Best Stage Performance, People’s Choice Award and Rising Star of India Award. 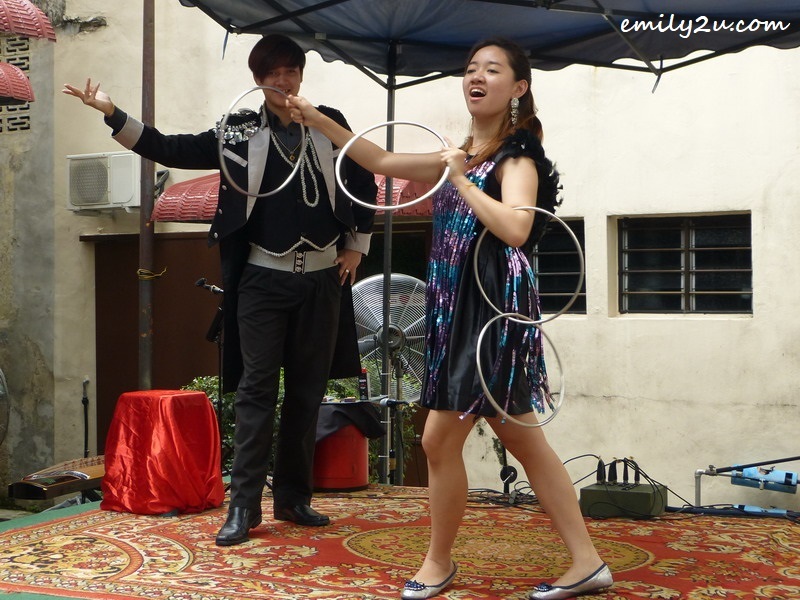 Those of us who have seen these siblings perform would be amazed to know that besides their magic skills, they can act, sing, dance, play the diabolo (Chinese yoyo) and the bamboo musical instrument, angklung. All four of them are martial arts exponents too. What is even more incredible is that they have also mastered the traditional face mask changing secret from Sichuan, China. Currently on a roadshow around Peninsular Malaysia to promote their upcoming “Big Secret Big Surprise Grand Illusion Show” on December 20, in conjunction with the school holidays, as all four are still studying, MRGJC Quest found time to chat with Malay Mail on their journey thus far. Like the many kids who were curious about magic and bought boxes of magic tricks and magic books using their pocket money, the Chee siblings have come a long way since then. Said Jorinn, “I was fascinated with magic since I was four years old. I loved watching Princess Tenko on TV. Later on, it was David Copperfield. I would say these two illusionists were my greatest influences back then. One of the most meaningful performances for Jorinn was at an old folks’ home when she was 7 years old, which she still remembers today. “I had thought that only children my age would enjoy magic, but after the show, an old lady who was about 90 years old came to me, with tears running down her cheeks, hugged me and said that it was the first time she had watched a live magic show and it was all the more special because it was on her birthday,” recalled Jorinn. That was the impetus for Jorinn, and with her prowess in the world of illusion, influenced her three younger brothers to follow in her footsteps. Citing a show in India as his most unforgettable performance due to the overwhelming response from the audience, Melkinn described himself as “an entertainer who would like to share happiness with the world through my performances”. 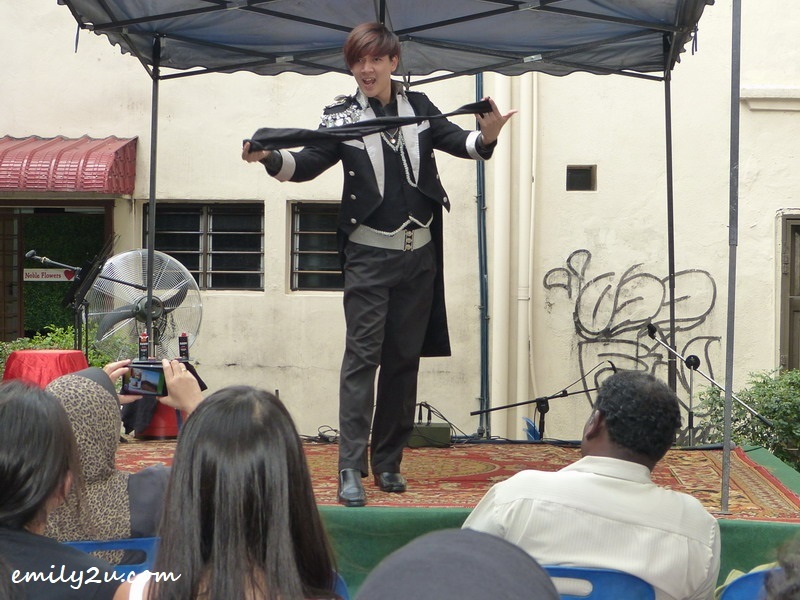 This lad of few words, who started charming the crowds with his magic at 6, sees himself performing in more “magically” advanced countries such as the United States, United Kingdom and Russia in ten years’ time. Meanwhile, fourth former Raykinn, who was unwittingly drawn into the world of magic by being his older siblings’ stage assistant, began to get involve in it at the age of nine. 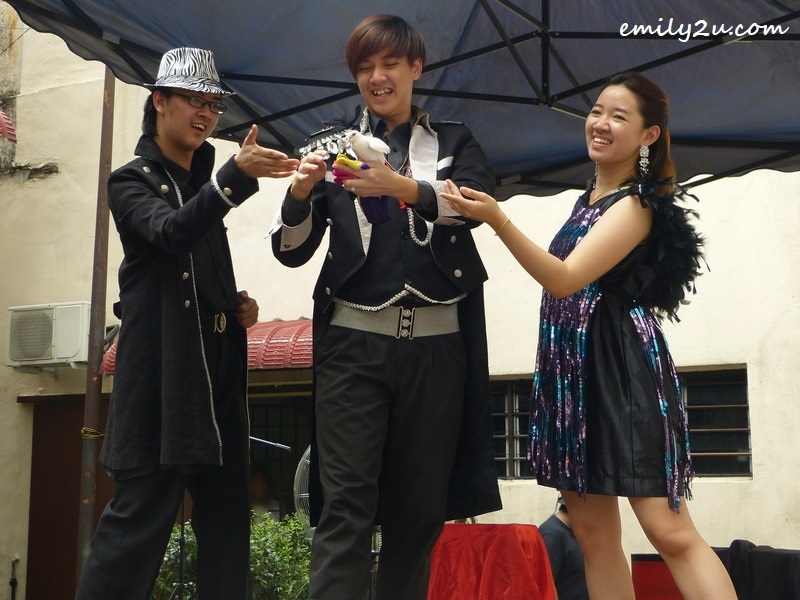 Between juggling lectures and performances, MRGJC Quest run their own studio, MRGJC Quest Academy, which was established three years ago when they were all still in their teens. Through this academy, workshops are conducted to groom young talents on magic, dancing, singing, art and craft and in playing the angklung. Note: An edited version of this article [Magic in The Family] was published on 13th December, 2014, in the now-defunct The Malay Mail.